"It is not impossible that a good person may go wrong ... but our human experience teaches us that if a daughter grows up in one of our homes to be 32 years old, educated in our schools, walking in our streets, associating with the best people and devoted to the service of God and man ... it is not within human experience to find her suddenly come out into the rankest and baldest murderess." "If a person wished to kill and avoid detection, and that person were wise, hydrocyanic acid would be the first choice among all deadly drugs." Prussic acid is, as she reminds us, a "diluted form of hydrocyanic acid." Immediately we're wondering exactly why Lizzie Borden is trying to buy it -- was she really interested in her cape or was there some other use she may have had in mind? From there we're taken directly into the Borden household, a place rife with tensions that had prompted locks for every door, Lizzie's resentment of her father's "determined economies" that among other things, kept the family from living on "The Hill" with the rest of the Fall River elite and put his daughters in "virtual social quarantine. And then, of course, there is the daughters' attitudes toward their stepmother Abby, which had gone from "chilly tolerance to open animosity" some five years earlier, resulting in the daughters' refusal to eat with their parents and to even speak with Abby "except in response to a direct question." Just before she launches into the murders, the investigation and the inquest, Robertson reminds us of an incident involving two possible food poisoning attempts in the Borden home. Part two is the longest and most detailed of the three, covering the trial. It is, in my opinion, the best and most interesting part of the book, because not only do we get a look at the actual court proceedings, in which we come to realize exactly what a circumstantial case it actually was, but even more fascinating to me was Ms. Robertson's presentation of the press coverage of the time. Journalists not only sat in court each day to record the events of the trial and Lizzie herself as she sat in the dock, but went on to provide speculation and opinion to its readers, in some cases making it very clear which side they were taking, rather than offering a more objective stance. Biased media? You bet. "Even as the murders themselves seemed summoned from a mythic reservoir of human darkness, the trial of the alleged perpetrator occurred in a specific time and place: America in the Gilded Age, its most deeply held convictions and its most troubling anxieties inscribed in every moment of the legal process. Lizzie Borden was a devout young woman 'of good family' -- a lady -- and an accused axe-wielding patricide. It should not have been possible." According to the "science" of the day, no one would have been surprised had the murderer turned out to be either someone whose "criminality" would have shown in features marking their ethnicity or class. It might have also been less sensational and more acceptable had the perpetrator turned out have been some strange man who just happened to be on hand to commit these terrible murders. But a woman of Lizzie's station hacking her parents to death so brutally seems to have been a scenario that would have, when all was said and done, constituted some sort of threat to the existing order of Fall River in that particular place at that particular time. 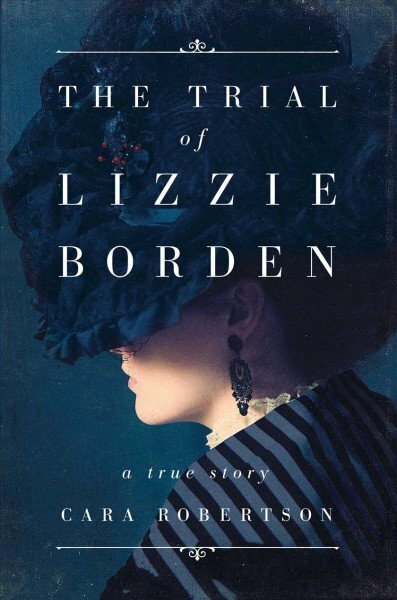 The Trial of Lizzie Borden is a book well worth reading for anyone who may have an interest in this case. Aside from placing the case within its particular social/historical context, the author seems to adhere closely to fact, doesn't go off on any tangents or theories that weren't expressed at the time, and keeps the narrative interesting enough for rapid page turning. I'm also utterly impressed at the scope of her research. I have read enough reader reviews to know that not everyone agrees with me, but aside from the weird word choice of "mansplaining," I have nothing to complain about. Very nicely done. I still think she did it. "because of the inherent difficulties of translation and analysis. When historians did consult the oral record, they often selectively used tales that supported their own preconceptions or the physical evidence, while ignoring the other tales as impossibly vague or unreliable." "discover a scenario which allowed use of all of the native recollections, solved some troubling discrepancies in the physical evidence, and led to some significant new conclusions as to the fate of the beleaguered sailors." 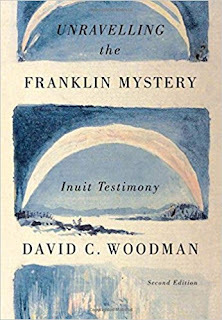 It is important to realize that the author doesn't claim to have definitive answers here, since as he says, the Franklin mystery is a "puzzle without the prospect of complete solution," but he does point out in the preface that the 2014 discovery of the Erebus "validates the long-known Inuit traditions" that he explores so thoroughly in this book. "it's almost certain that HMS Terror was operationally closed down by the remaining crew who then re-boarded HMS Erebus and sailed south where they met their ultimate tragic fate." 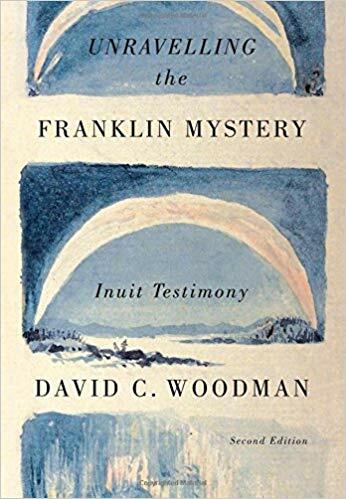 By examining different but amazingly consistent Inuit accounts, Mr. Woodman had come to much the same conclusion in this book over twenty years earlier. And while he was a bit off when it came to the location of the Terror, in terms of the location of the Erebus he relied on clues given by the Inuit that put one of Franklin's ships somewhere near O'Reilly Island on the western side of the Adelaide Peninsula that ultimately proved correct -- including the fact that not only had it been visited by Inuit people while still intact, but he also discovered what would turn out to be an important revelation: the ship eventually sank in shallower waters where they could still see mast heads above the surface. 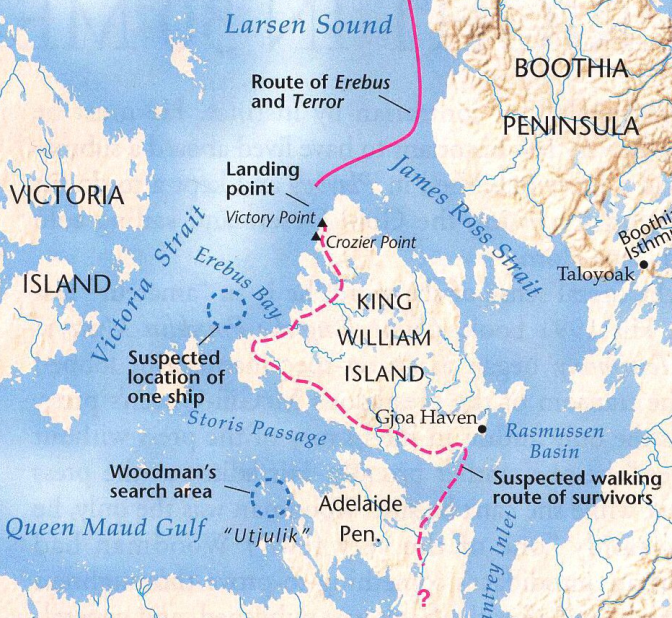 While I'm just a very casual armchair explorer, it wouldn't surprise me if Unravelling the Franklin Mystery might someday gain recognition as one of the most significant works about the expedition, not just for the author's theories but mainly because of its focus on illuminating the importance of Inuit oral tradition. At the same time, it can be a difficult and most challenging book to read, since it often gets a bit confusing with threads of one story that are picked up in later chapters as he tries to connect dots between accounts, often causing me to have to go back and reread what was said earlier. 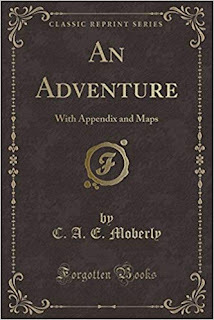 The other thing I wasn't in love with were the maps in this book. I had several tablet windows open off and on while I read, each with a map so that I could follow the known progress of the expedition, the routes of previous polar expeditions, more specific maps of both coasts of King William Island and then, of course, the western side of the Adelaide Peninsula where the author posited that one of the ships had finally come to rest. Having said all that, I was immediately engrossed and I probably can't even look at another book about the Franklin Expedition for a while, because this one is so good. Very highly recommended to anyone even remotely interested in the subject. All I have left to say is that I'm completely in awe of the author's research skills and what he's done here; I'll have to work very hard to find another one that can impress me as much as this book. "Were I not a girl, I would be a soldier!" 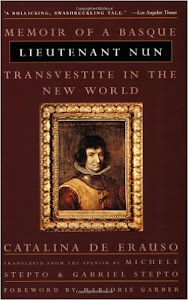 In trying to make a dent in my hugely-oversized tbr pile, I picked up this book some time ago to read alongside Patricia Duncker's novel about James Miranda Barry, The Doctor (0060090413, Ecco, 1999), which has probably been sitting there since it was published. 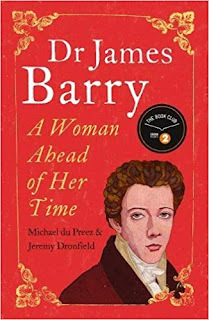 As I noted on my brief post-reading entry for this book at Goodreads, Dr. James Barry: A Woman Ahead of Her Time is probably one of the best biographies I've ever read, and trust me, I don't say that lightly. "was many things in his life: Inspector General of Hospitals, army surgeon, duellist, reformer, ladykiller, eccentric. He performed the first successful Caesarean in the British Empire, outraged the military establishment, and gave Florence Nightingale a dressing down at Scutari." Barry had left Ireland and enrolled in medical school in Edinburgh in 1809, and in his last year of study nearly missed being able to take his final exams because he was believed to be "too young to take a degree." By 1812, though, he had graduated as an MD. It was then that "Dr. James Barry had been officially conjured into existence," which may seem an odd statement except for the fact that James Barry had started his life as Margaret Bulkley in 1789.
reaching the ears of people who'd known James Barry throughout his career and all the way back to his youth more than half a century earlier." "...if she wasn't 'James Barry' -- which she manifestly wasn't -- then who the devil was she?" The two authors of this book then move back in time to answer this question, starting in Ireland with Margaret's childhood, moving on to the plan for Margaret to pose as a young man as a means to acquire an excellent education and then move on to university in Edinburgh for medical training. The idea, it seems, was that after Margaret finished medical school as James Miranda Barry, she would travel as Margaret to practice medicine in Venezuela after General Don Francisco de Miranda had liberated the country. After Barry obtained his degree and "the coveted 'MD' after his name,"
"the time was coming for Margaret to cross the ocean and fight for revolution, putting aise the shell of James Barry, casting off the surtout, the cravat, the breeches and hat, the posture and imposture, Margaret Bulkley would emerge again, bringing her dresses out of storage, saved forever from the doom of drudgery as a governess or a man's possession. In the new revolutionary utopia of Venezuela, all that would matter would be her hard-won skills and knowledge." "Without her principal benefactor and the unique escape route he had offered, she had no choice but to remain in Britain, no more able to escape her male persona than Miranda could free himself from his Spanish gaol. Whatever the future held, Dr. James Barry was not yet done with, and the trunk of dresses and petticoats would remain shut." James Miranda Barry from the website of the University of Edinburgh College of Medicine and Veterinary Medicine. 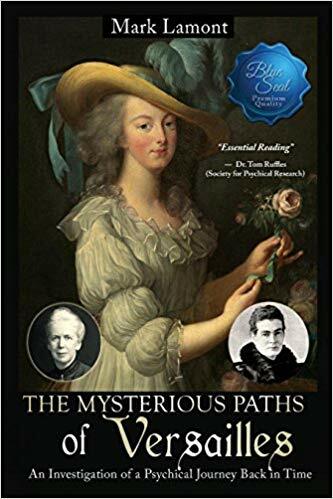 Her options as Margaret were rather few -- she might have become a governess or a married with limited freedom; instead she decided to continue as Dr. James Miranda Barry, and the authors go on to document his long and distinguished Army career which began in 1813. He was fortunate enough to have great connections which helped him through rough spots more than once; he was compassionate toward his patients, and made a number of innovative reforms. On the other hand, Barry also had a tendency to rub some important people the wrong way due to his temperament, most especially people who either got in his way or proved themselves to be quacks or ill qualified to be practicing medicine, garnering the reputation as a "tyrant," with an "irritable and impatient temper" which "brought him into constant collision with authority." 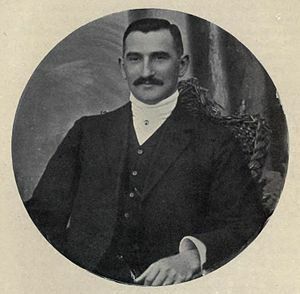 As the authors explore the course of his career which took him throughout the British Empire, they reveal that there were several people who likely knew or at least guessed at Barry's secret, and never revealed it. Sometimes, "the general impression and general belief were that he was a hermaphrodite," but the few others who knew protected him, keeping their first-hand information to themselves. Anyone considering reading this book ought to know that while each and every facet of this study has been meticulously researched, Dr. James Barry: A Woman Ahead of Her Time is a compelling read that kept me turning pages. Margaret Bulkley made a choice that allowed her to live life to its fullest, and while we get some hints that she may have missed her identity as a woman at times (for example her trunk with the pictures of ladies' fashions on the lid), for Margaret and for James Miranda Barry it seemed to have been the right choice. An excellent and truly exquisite book, I would recommend this book to anyone. On the night of December 21, 1908, 82 year-old Marion Gilchrist sent her maid, Helen Lambie, on an errand to pick up an evening paper. When Lambie returned, a downstairs neighbor was waiting at the door of Miss Gilchrist's flat on West Princes Street, Glasgow, and told her about some "fearsome noises" he and his sisters had heard in the Gilchrist flat from their flat below. Lambie had a likely explanation in the pulleys used for the clotheslines, but the neighbor decided to wait at the door anyway while Lambie went in. As she did so, a man came toward her from the flat's spare bedroom and walked past Lambie and the neighbor. Lambie, going into the dining room, called for the neighbor to come in, and discovered Marion Gilchrist laying on the floor with "nearly every bone of her face and skull being smashed." The neighbor ran to get the police while Lambie made her way to find Miss Gilchrist's niece. By the time she went back to West Princes Street and the scene of the crime, a doctor had discovered a "heavy dining room chair" that was likely the murder weapon, since Miss Gilchrist's wounds matched the shape of the "spindle-shaped legs." As the night went on, a few Glasgow police detectives came to the flat. Papers had been strewn all around in the spare bedroom, jewelry belonging to Miss Gilchrist seemed be present and accounted for, with the exception of a "crescent-shaped diamond brooch", valued at fifty pounds. Also noted: there was no sign of forced entry, meaning that the woman who normally kept her doors soundly locked most likely let her killer into the flat. A warning went out to the "Pawns" about the brooch, and four days later, a bicycle dealer revealed to the police that he knew a man who'd been trying to sell a pawn ticket for a brooch matching the description of the stolen one. It wasn't long before detectives honed in on the man with the ticket, a certain Oscar Slater. The police became focused on this man, believing they had the right guy since, after all, he was already a man of interest -- he was reputed to be a pimp, a petty criminal, and they also discovered that Slater was on his way to America with his girlfriend. He was picked up, arrested, held in New York City, but agreed to be extradited back to Scotland to prove that he was not guilty. In the meantime, the brooch that had been pawned turned out not to have been the one stolen from Miss Gilchrist; the Glasgow police, however, were certain that they had the right guy, and explored no other avenues, leaving out any other possible culprits and dismissing testimony from people who could have exonerated Slater. The case, which came down to some pretty iffy eyewitness identification, went to trial; in May, 1909, Slater was found guilty and sentenced to death, with sentenced commuted to hard labor for life. The story might have ended there, but in 1912, Arthur Conan Doyle was asked to take a look at the case, which he did using the same sort of logical, rational approach he had imbued in his creation Sherlock Holmes to go over the particulars of the Slater case in order to try to redress the huge miscarriage of justice that had occurred three years earlier and sent an innocent man to prison. "straddles the twilight of nineteenth-century gentility and the upheavals of twentieth-century modernity,"
a "Janus-headed era" which looked both forward and backward. It was a time in which police work moved along two investigative paths, both of which she notes, existed side by side: a "nascent, rationalist twentieth-century science that would come to be called criminalistics" -- a "scientific, rationalist" approach, and the "murky nineteenth-century pseudoscience known as criminology," based largely on work developed by Cesare Lombroso whose theories posited that criminality was inherited and that there were "born criminals" who could be identified on the basis of certain racial and ethnic "signifiers." That's just a quick version of his ideas; there were even worse parts of Lombroso's ideas that I won't go into here. The Glasgow police evidently chose to not take their time and do a rational analysis of the case based on what they actually had in the way of evidence (which was pretty much nothing), but set against the backdrop of rising anti-Semitism and xenophobia, police, prosecutors, and even the judge succeeded in making Slater, a German, a Jew, and a known petty criminal, and "one of the most convenient 'convenient Others' of his age" into the perfect a murder suspect. To get a conviction, they all they engaged in some pretty dodgy practices involving "suborned perjury, withheld exculpatory evidence, and all the inflammatory illogic that the criminological method allows." Over the course of this narrative, among other things, the author also seeks to reveal Oscar Slater as a human being rather than just an unwanted "Other." 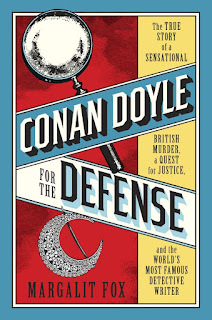 She also examines Conan Doyle as a crusader, an "emblematic avatar" of the "long nineteenth century," which as the author says, ran beyond the century mark up to the outbreak of the first world war. 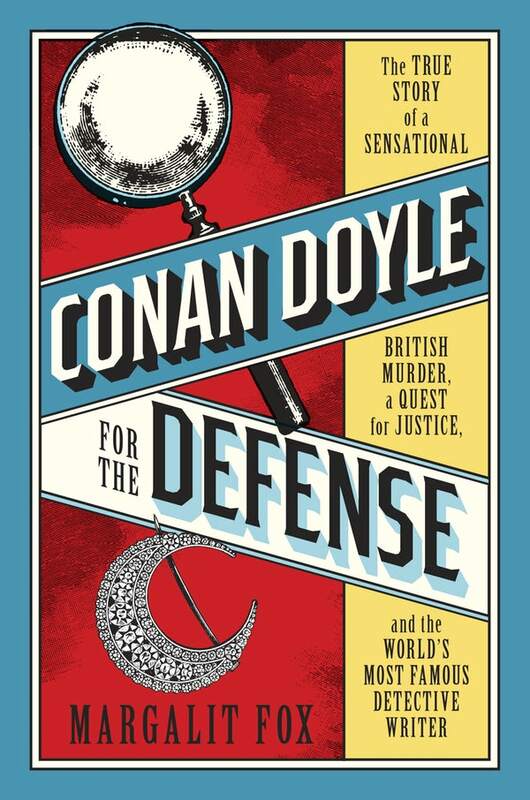 "For all the scores of biographies of Arthur Conan Doyle, creator of the most famous detective in the world, there is no recent book that tells this remarkable story, in which Conan Doyle becomes a real-life detective on an actual murder case." I love David Grann's work. I've read his The Devil and Sherlock Holmes which I loved, The Lost City of Z which I loved even more, and I've already pre-ordered his next book The White Darkness, which comes out in October, although you can get a head start on it via The New Yorker. 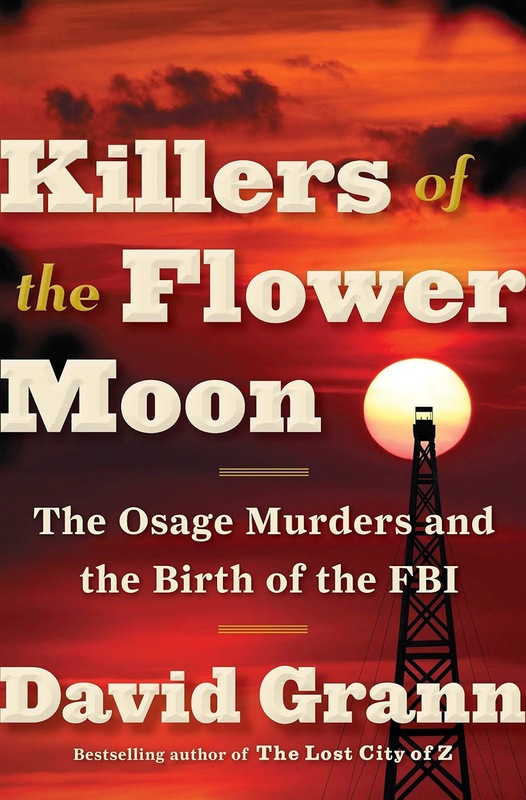 This book, Killers of the Flower Moon, is probably the most difficult of all of his books to read on an emotional level, since it deals with such an horrific topic. This one I had to read sections at a time because it was so powerful; it also made me so damn angry I actually found myself yelling. 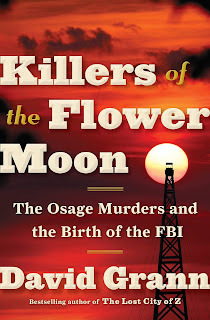 Personally, when a person like David Grann can hand me a story that gets me that emotionally involved, well, he has done his job and has done it well. "Over the tribe's vehement objections, many Osage ... were deemed 'incompetent' and were forced to have a local white guardian overseeing and authorizing all of their spending, down to the toothpaste they purchased at the corner store. One Osage who had served in World War I complained, 'I fought in France for this country, and yet I am not allowed even to sign my own checks.' "
Even worse than the Feds' prejudice in setting up these guardianships in the first place, these people were generally chosen from among the most prominent citizens in Osage County, and in what can only be called a racist move, all of them were white. In telling this story, Grann has focused on the family of an Osage woman named Mollie Burkhart. As he explains in an interview at vice.com, placing Mollie at the center of the story allowed him to treat her as a real person, not just a statistic or a descendant, and it also gave him the opportunity to tell things from the point of view of the Osage. The first section takes us to the murders of several members of the Osage Nation, of which Mollie's family became a "prime target," "one by one." The FBI becomes involved in part two, in which Grann goes through why J. Edgar Hoover wanted his men on the case, the possible suspects, and introduces us to Tom White, a former Texas Ranger turned FBI agent who put together a team that would work undercover to try and solve the case. While I won't dwell here on what happens next, one of the most infuriating parts about these murders is that the more deeply White delves at the time, the more a much larger picture of a huge and all-encompassing conspiracy develops and truthfully, I wondered if anyone was ever going to be brought to justice for these horrible crimes. But it's really part three that shook me to my core, because of what Grann discovers in his research. About that I will say nothing, but I could hear myself gasping at the implications of what he found. And to be really honest, I was so upset after finishing this book that I had to step away for a few days just to get myself together again. The book is masterfully done, especially since the author sets what happens to these people in the context of the broader period of rampant corruption and graft at the highest levels of government, and in that sense, provides a background for what will occur over the course of this narrative. At the same time, this book further reinforces the fact that when history is recounted in this country, it's white history, while the Native Americans' stories are for the most part completely ignored. You only have to be breathing these days to understand why that is. But overall, what really hit home was the fact that this is not only a story that needed to be told and to be brought out into the open, but that as Grann says, it continues to resonate with the Osage people -- that it is a story that is "still living history for them." "I couldn't connect with any of the victims due to a lack of back story or personal history. The reader just doesn't get to know the characters. It read like a boring history book that could have been so much more." To each his/her own, of course, but evidently we didn't read the same book. "I looked around, and there was the jungle, manifesting the same seething hatred, wrathful and steaming, while the river flowed by in majestic indifference and scornful condescension, ignoring everything: the plight of man, the burden of dreams, and the torments of time." A couple of months ago I found great joy in reading Ned Beauman's strange but wonderful novel Madness is Better Than Defeat, set mainly in the Honduran jungle which among other things, features a character whose task is to direct a film called "Hearts in Darkness" against the backdrop of an old Mayan temple. What he and his crew of actors and others do not know before they leave is that this same temple is also the destination for another group sent into the jungle, whose job is to dismantle the ruin piece by piece and ship it back to the US. Eventually both groups come together and a standoff ensues. One of the things that struck me while reading this book was the director's obsession with finishing this film and getting it just right in spite of the ensuing calamities, and it was impossible to read it without thinking about the making of Apocalypse Now and all of the huge setbacks encountered by Francis Ford Coppola. 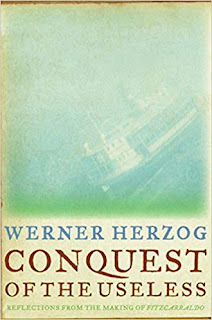 After reading the book I looked through several interviews with Ned Beauman, and somewhere (and with apologies, I was dumb and didn't bookmark it), he made mention of Werner Herzog, another obsessive director who made Fitzcarraldo. I'd seen the movie eons ago but I decided I'd watch it again, which then led me to Burden of Dreams, the story behind that film. Both were fascinating, but I wasn't quite finished yet -- I had to buy a copy of Herzog's Conquest of the Useless: Reflections from the Making of Fitzcarraldo because at that time I was hooked on this story. And I had to know what made this man tick. As Herzog tells us in his preface, the book is not a collection of "reports on the actual filming," and it is not a journal, "except in a very general sense." He refers to it as "inner landscapes, born of the delirium of the jungle," but then says that he's not sure if that's really it either. The book covers the period from June 1979 through November 1981, and while it is filled with some of the struggles he endured while trying to get his movie off the ground, it is also a deeply personal account, suffused with his observations about the Amazon jungle, its people, the rivers, and his relationship with nature, trying to find some insight into it all while trying to maintain a sense of calm as the leader of the enterprise. "It was the vision of a large steamship scaling a hill under its own steam, working its way up a steep slope in the jungle, while above this natural landscape,, which shatters the weak and the strong with equal ferocity, soars the voice of Caruso, silencing all the pain and all the voices of the primeval forest and drowning out all birdsong." In Herzog's film Fitzcarraldo buys a ship and uses the native people who have joined him and his crew to move the ship up a steep slope to another part of the river where he can access his newly-bought rubber holdings, the profits of which he will use to realize his dream of building an opera house in Iquitos (a la the Teatro Amazonas in Manaus). 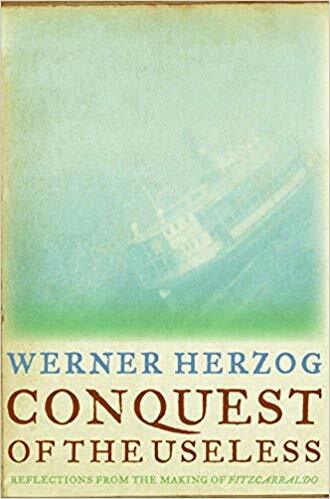 I won't go into any great detail here, but what I discovered in reading this book is that there are a number of similarities between Herzog and his character Fitzcarraldo, who is more than once referred to in the film as "the conquistador of the useless." Both are dreamers, and both in their own way are lunatics, compelled by their visions. As just one example, Herzog's backers assumed he'd use a model steamship, but no -- as he says here, he had to have a real one "being hauled over a real mountain" because it was stylistically characteristic of "grand opera." In another entry from February 18, 1981, he goes so far to note the idea of playing Fitzcarraldo himself, "because my project and character have become identical." There is no greater truth in this book to be sure. "...Outside I looked down at the river for a long time, trying to regain some composure. Chatas, flat barges, are chugging along, carrying pipes for distant oil-drilling operations. Belén is partially under water. Today at daybreak the birds were pleading for the continued existence of the Creation. For them, anything but the continuation of the status quo is deadly. My watch has stopped now once and for all but for a long time I have been thinking in Amazonian terms anyway: before dinner, after the storm, toward evening. A blind, barefoot beggar was groping his way along the wall of a house. A woman was drinking water from an aluminum pot in which slimy fish from the river, with big eyes, were floating. One of them was dead, its underside white, belly up. Then a child drank from the pot." Having seen Fitzcarraldo before reading this book, I wasn't surprised here at his ability to pick up on such detail, but I came away from Conquest of the Useless with the conviction that his artistry went well beyond his directing skills. Of course, if you're interested in such details as his frustration with Klaus Kinski, or what it was like to work with Mick Jagger and Claudia Cardinale, that's here too, but this book reaches much deeper than a simple tell-all sort of thing. highly recommended, even for people who haven't seen the movie, but you'll get much more from it if you do.